Heineken has launched StarPlayer, a dual-screen football game, as part of its Uefa Champions League (UCL) sponsorship that fans can play while watching the football on TV. The free StarPlayer game, by AKQA, allows fans watching football on TV to anticipate the scores and events as they happen on the pitch, such as free kicks and corners. The interactive game can be played in real-time via iPhone, Facebook and iPod touch. At certain points throughout the game, users are asked a series of trivia questions to win points. 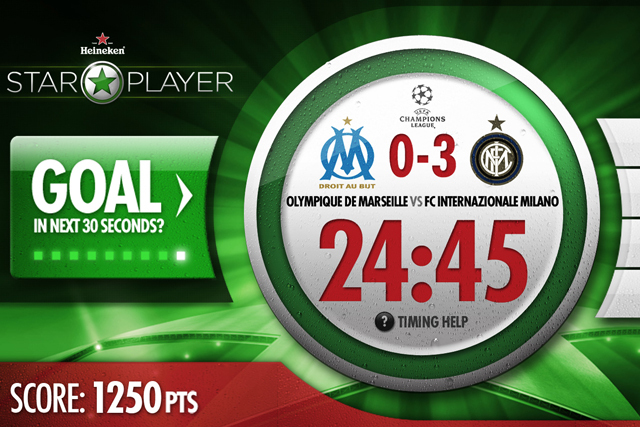 The game can be played on the Heineken Facebook page or downloaded from the App Store from today. Heineken plans to make it available across multiple platforms, including Android and tablet devices. According to Heineken, 75% of TV viewers are "dual-screening" and 72% watch the UCL at home alone. Heineken has sponsored the Uefa Champions League since 2005. The game will run until the end of its sponsorship, which is contracted until the 2012 season. Speaking at a launch event for the game at the Emirates stadium yesterday, Floris Cobelens, global head of digital at Heineken, said StarPlayer was designed to create excitement for its consumers around the sponsorship of the UCL. According to James Hilton, co-founder of AKQA, Heineken is the first brand to leverage dual screening in this way, and the app is the most complex the agency has ever created. Heineken will also be promoting the StarPlayer with an iAd, which launches today (27 April) and runs until 28 May, to coincide with the UEFA Champions League final. Earlier this month, Heineken introduced its global ad campaign, created by Weiden+Kennedy Amsterdam, to UK audiences.